When you’re planning a skiing holiday to one of the resorts in the greater Toronto area, remove the worry of renting a car from the equation. You’ll enjoy your trip more when you let us get you to your destination safely and in comfort. We’ll pick you up at Toronto Pearson International Airport (we also cover other area airports) or your hotel. You can relax in comfort while our professional drivers provide you with transportation. Most of the ski slopes in the Toronto area open early in December, so now is the time to start planning your ski trip. We have limos and party buses for every special occasion and every size group. 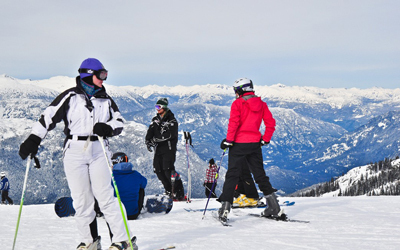 We can get you to your choice of the regional ski resorts in the Toronto area, which are great for vacationers who want to ski, snowboard, or snow tube. Blue Mountain on Georgian Bay is one of the most popular ski resorts in Ontario. The resort has 350 acres of terrain and is a great choice for families. Blue Mountain has four lifts so you can avoid long lines. Calabogie is a popular destination for skiers and snowboarders. The resort features eighteen runs and snowboarding is allowed on all of them. Eleven lifts avoid lines and get you to the summit quickly. Most runs are for beginner and intermediate skiers, with thirty percent for advanced skiers. Horseshoe Resort has one of the longest runs in Ontario. The runs are well lit for nighttime skiing. More than half the runs are for advanced skiers. For anyone who prefers activities other than alpine skiing, snowshoeing and cross country skiing are options. The Mount St. Louis Moonstone resort is located just outside Barrie. The resort has twelve lifts. Individual and group lessons are available, and childcare is provided on weekends and holidays. Recent additions include new snowboard parks. The resort opened the first quad lift in Canada and now has high-speed lifts. Most of the ski resorts in the area are a short drive from the Toronto airport in the central part of the province and are in southern Ontario. The ski areas in Ontario are a good choice for families, with great amenities for kids.